Make a Double Rainbow Dazzle Top from I Love to Create for all of your favorite rainbow enthusiasts. Keep an eye out for a rainbow in the sky while you make tie dye shirts in all shapes and sizes. Use these rainbow tie dye techniques to adorn all of your clothes with the bright colors of Roy G. Biv. Prewash T-shirt to remove sizing; do not use fabric softener. Cover work surface with Surface Cover and lay shirt flat on prepared surface. Scrunch shirt into a tube shape and wrap eight rubber bands from kit around shirt, creating nine equally spaced sections. Wearing plastic gloves, add water to all dye bottles. Replace caps tightly then shake until dye is dissolved. Referring to photo, squeeze Red onto first section (top) of shirt. Skip next section then squeeze Blue onto third section. Moving back up to the second section, at the same time, squeeze both the Red and Blue dyes onto the second section and use hands to work in and mix dye, creating Purple. Skip next section underneath Blue section and squeeze Yellow onto fifth section as shown. After applying Yellow, working at the same time, squeeze Yellow and Blue onto the section between Yellow and Blue sections and use hands to work in and mix dye, creating Green. Skip section underneath Yellow section and squeeze Red onto seventh section as shown. After applying Red, working at the same time, squeeze Red and Yellow dyes together between Red and Yellow sections and use hands to work in and mix dye, creating Orange. Leave a section underneath the Red section and on the bottom section of shirt, squeeze Blue as shown. After applying Blue, working at the same time, squeeze Red and Blue together between Red and Blue sections and use hands to work in and mix dye, creating Purple. Cover shirt with Surface Cover to keep damp and let set 6 to 8 hours or longer for most intense colors. Fully rinse dyed shirt in warm water until water runs clear, removing rubber bands at this time. Fill washer to large load setting with hottest water suitable for T-shirt fabric and a small amount of laundry soap. Wash and dry separately. 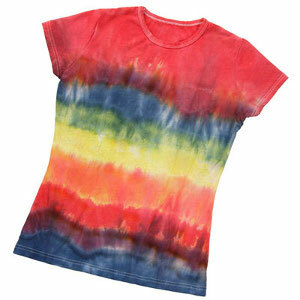 For more tie-dye designs, check out How to Tie-Dye a Shirt: 11 Colorful Tie-Dye Designs. Always looking for new ideas for tie dye. My kids love making new shirts. We will try this one.